The “Israeli” apartheid regime on Wednesday said it planned to expand a key missile system to warships, in a bid to protect the country’s lucrative offshore gas fields amid growing aerial threats from regional adversaries. 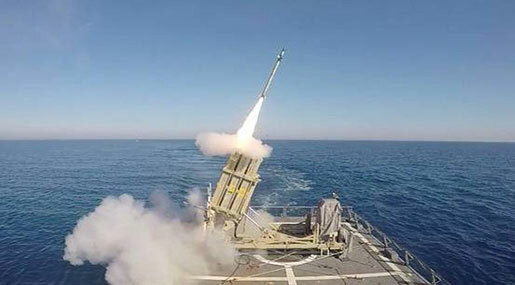 “Israel’s” military said it had successfully tested a naval version of its land-based Iron Dome system in recent weeks and would begin deploying it on its newest frigates to protect the country’s strategic assets, including its gas rigs. The naval system is a combination of the land-based Iron Dome missile interceptor and radar systems on ships, the military said. “We call it the Iron Dome of the sea,” Col. Ariel Shir, head of operational systems in the “Israeli” navy, told reporters on a phone call. The “Israel” entity’s land-based Iron Dome missile system intercepts short-range rockets and has become a bedrock of the country’s military capability since its introduction in 2011. The ship-based Iron Dome system would augment a combination of land-based systems that the “Israeli” entity had jointly developed with the US, and that it hopes will provide a layered shield against a variety of short range missile threats to those capable of flying more than 600 miles. “Israeli” war officials fear an operation by Hamas or Hizbullah could severely damage the gas rigs and significantly disrupt supply to “Israeli” settlements and businesses. Thus, “Israeli” military officials had become concerned about Hizbullah’s ability to target facilities offshore using increasingly sophisticated anti-ship missiles. In 2006, an “Israeli” navy ship was struck by a sophisticated Hizbullah missile. Natural gas from the country’s offshore fields provides about half the total volume of electricity to the “Israeli” entity, according to the country’s electricity authority. Government-owned companies Rafael Advanced Systems Ltd. and “Israel” Aerospace Industries Ltd. have developed the new naval Iron Dome missile system, the military said. US Congressman Brian Higgins, a member of the House Committee on Foreign Affairs, introduced legislation for the US to aid the “Israeli” entity in protecting the gas reserves. The legislation would provide backing to use the entity’s new David’s Sling air system, an adjunct to Iron Dome, for protection of the gas fields. The “Israel” apartheid regime’s war ministry last year signed a contract with the German shipbuilding group ThyssenKrupp Marine Systems GmBH for the construction of four ships intended to protect gas drilling platforms. The new Iron Dome system would likely be added to these and existing ships, the military said. Iron Dome is only one part of an expanding “Israeli” air force effort to protect the country from rockets and missile attack. The country also plans to add two other new defensive systems, called David’s Sling and Arrow 3, to address evolving regional threats. The new systems will respectively protect against the medium-range missiles, largely held by Hizbullah, and long-range ballistic missiles developed by Iran. “Israeli” war officials say the combination of Iron Dome, David’s Sling and Arrow-3 will enable the military to prioritize different rocket or missile attacks based on their speed, trajectory and distance. They augment existing military systems, including the Arrow-2 ballistic-missile system designed to shoot down some types of ballistic missile. The tiered “Israeli” missile approach had been built in partnership with US war contractors, including Raytheon Co., Boeing Co. and Lockheed Martin Corp., the world’s biggest weapons maker by sales. The US government has provided more than $3 billion over the past 10 years to support the military system. Details on further developing and funding “Israeli” missile system are part of current discussions between the “Israeli” apartheid regime and the White House on a new military aid package, according to “Israeli” war officials. The White House had said it is willing to increase the current $3 billion a year in military aid, which is intended to help the “Israeli” entity maintain a military edge over other countries in the region.